Shri Piyush Goyal said that education must aim at providing future leadership and it should aim at the pursuit of excellence. Education must produce good citizens able to serve the country at all times and in all circumstances, he added. The Minister further said that education would reduce the disparities in wealth and power by providing young people with skills and competence to make them find a valued place in society. On Good Governance the minister said that it is the shared responsibility of Educators, Political Class, Artists, Business, etc; to bring Good Governance to society. Shri Goyal said, Education’s prime aim is to make every individual Self Reliant. 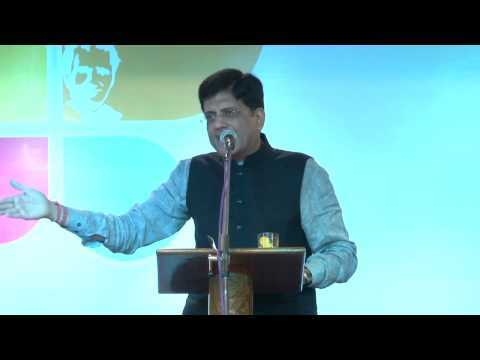 On Extremism, Shri Piyush Goyal said that the root cause is attributed to Poverty, illiteracy and ignorance. It is the bounden duty of educators to eliminate/ eradicate the above through quality education to all specially to the unreached sections of society. The Minister said “we must preach and practice the Preamble to the Constitution of India which gives equality to all citizens in faith and in truth. Union Water Resources Minister Sushri Uma Bharti and Delhi Chief Minister Shri Arvind Kejriwal have agreed to set-up a Special Purpose Vehicle (SPV) for the cleaning-up and rejuvenation of the Yamuna River. It has been agreed to prepare a blueprint for this purpose during the next 45 days. This was decided in a meeting between the Union Minister and the Chief Minister held in New Delhi today, which was also attended by Delhi’s Minister-in-charge for Water, Shri Kapil Mishra and senior officials of concerned departments from Central and Delhi Governments. Sushri Bharti accepted the Chief Minister’s request of convening a joint meeting soon with Union Urban Development Minister Shri M Venkaiah Naidu and Union Road Transport and Highways Minister Shri Nitin Gadkari.The Chief Minister expressed the view that such a meeting is important since all the concerned Ministries/Departments would have to work together for cleaning the historic river and reviving its past glory. Sushri Bharti said she will take up the matter with the concerned Ministers and will intimate the Chief Minister about the possibility of this meeting. In today’s meeting, the issues related to beautification of the Yamuna River Front was also discussed. The two sides expressed confidence that a joint effort will lead to a clean Yamuna, an issue which has now been pending since decades. The Cabinet Secretary, Shri Pradeep Kumar Sinha has reviewed the ongoing search operations of the missing Officers and the Pawan Hans Helicopter in Arunachal Pradesh, here today. The helicopter went missing on August 04, 2015 with two crew members, Captain M S Brar and Captain Rajiv Hoskote, and the Deputy Commissioner of Tirap, Shri Kamlesh Joshi on board. The Cabinet Secretary has directed that all available technical (including satellite imagery) and human inputs must be deployed by both the State and Central Government to locate the missing Officers and the helicopter. Earlier today, the Union Home Secretary, Shri L.C. Goyal also reviewed the search operations in a high level review meeting of the State and Central Government agencies involved with the search of the missing Officers and the Pawan Hans Helicopter in Arunachal Pradesh. The meeting was also attended by the Defence Secretary, Secretary (Telecom) and heads /senior officers of the Government of Arunachal Pradesh and Ministry of External Affairs and Union Armed Forces and Central Intelligence and Security Agencies. The Minister of State for Culture (Independent Charge), Tourism (Independent Charge) and Civil Aviation, Dr Mahesh Sharma inaugurated the Bhisham Sahni’s birth centenary celebration here today. On the occasion, Dr Mahesh Sharma inaugurated a photo and book exhibition focusing on Bhisham Sahni and also released a monograph on him. The Ministry of Culture with the support of Sahitya Akademi is celebrating the birth centenary of the famous Hindi writer Bhisham Sahni. Speaking on the occasion Dr. Mahesh Sharma said Bhisham Sahni was a great legend. He further added that the Government has plans to promote Bhisham Sahni's legacy and literature across the country. Dr Mahesh Sharma also said that the Government has plans to make India as a spiritual and cultural leader in the world. He also said that a think-tank has to be formed to enrich Indian literature. A documentary on Bhisham Sahni produced by the Sahitya Akademi was also screened on the occasion. The event is a 3-day celebration from 8-10 August, 2015. The secretary of Culture and Tourism (Additional charge) Shri Narendra Kumar Sinha and other senior official of the Ministry, along with nephew of Bhisham Sahni, Shri Parikshit Sahni and Sahitya Akademi President Dr Vishwanath Prasad Tiwari were present on the occasion. The Prime Minister, Shri Narendra Modi has condemned the attacks in Afghanistan. "I strongly condemn the gruesome and cowardly attacks in Afghanistan. My thoughts are with families of the deceased and prayers with the injured", the Prime Minister said. The President of India, Shri Pranab Mukherjee has extended his greetings and felicitations to the Government and people of the Republic of Singapore on the eve of their National Day (August 9, 2015). In his message to His Excellency Dr. Tony Tan Keng Yam, the President of the Republic of Singapore, the President has said, “On behalf of the Government, the people of India and on my own behalf, I extend my warm greetings and felicitations to you and to the people of Singapore on the occasion of your National Day. India and Singapore share civilisational and historical links. An important chapter of India’s freedom struggle was enacted in Singapore. Our countries have a robust and multifaceted relationship which has fostered our bilateral and regional engagement. As we celebrate 50 years of diplomatic relations between our two countries, it gives me immense pleasure to note the substantive enhancement of our bilateral cooperation in various fields. I am confident that this partnership will continue to grow and strengthen to our mutual advantage and for the benefit of our region.